This article is about the Japanese art form. For the Death Cab for Cutie album, see Kintsugi (album). Rural cooking pot repaired with Kintsugi technique, Georgia, 19th century. Kintsugi (金継ぎ, "golden joinery"), also known as Kintsukuroi (金繕い, "golden repair"), is the Japanese art of repairing broken pottery with lacquer dusted or mixed with powdered gold, silver, or platinum, a method similar to the maki-e technique. As a philosophy, it treats breakage and repair as part of the history of an object, rather than something to disguise. Lacquerware is a longstanding tradition in Japan, and at some point kintsugi may have been combined with maki-e as a replacement for other ceramic repair techniques. 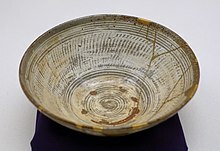 While the process is associated with Japanese craftsmen, the technique was also applied to ceramic pieces of other origins including China, Vietnam, and Korea. Kintsugi can relate to the Japanese philosophy of "no mind" (無心, mushin), which encompasses the concepts of non-attachment, acceptance of change, and fate as aspects of human life. Staple repair is a similar technique used to repair broken ceramic pieces, where small holes are drilled on either side of a crack and metal staples are bent to hold the pieces together. Staple repair was used in Europe (in ancient Greece, England and Russia among others) and China as a repair technique for particularly valuable pieces. Kintsugi is the general concept of highlighting or emphasizing imperfections, visualizing mends and seams as an additive or an area to celebrate or focus on, rather than absence or missing pieces. Modern artists experiment with the ancient technique as a means of analyzing the idea of loss, synthesis, and improvement through destruction and repair or rebirth. While originally ignored as a separate art form, kintsugi and related repair methods have been featured at exhibitions at the Freer Gallery at the Smithsonian, the Metropolitan Museum of Art, and the Herbert F. Johnson Museum of Art, Cornell University Ithaca NY, USA. ^ a b c Gopnik, Blake (March 3, 2009), "At Freer, Aesthetic Is Simply Smashing", The Washington Post . ^ a b "Golden Seams: The Japanese Art of Mending Ceramics", Freer Gallery of Art, Smithsonian, archived from the original on 2009-03-17, retrieved 3 March 2009 . ^ "Kintsugi: The Centuries-Old Art of Repairing Broken Pottery with Gold". My Modern Met. 2017-04-25. Retrieved 2017-07-12. ^ Ota, Alan K. (September 22, 1985). "Japan's Ancient Art of Lacquerware". New York Times. ^ Ken, Johnson (April 4, 2008). "A Craft Polished to the Lofty Heights of Art". New York Times. Retrieved April 5, 2014. ^ a b "Golden Seams: The Japanese Art of Mending Ceramics". Smithsonian. November 8, 2008. Retrieved 2014-04-05. ^ Gopnik, Blake (March 3, 2009). "'Golden Seams: The Japanese Art of Mending Ceramics' at Freer". The Washington Post. ^ "Kintsugi Is Recognizing Beauty in Broken Things | Make". Make: DIY Projects and Ideas for Makers. 2015-08-17. Retrieved 2017-07-12. ^ a b Andrea Codrington, Lippke (December 15, 2010). "In Make-Do Objects, Collectors Find Beauty Beyond Repair". New York Times. Retrieved 2014-04-05. ^ Kwan, Pui Ying. "Exploring Japanese Art and Aesthetic as inspiration for emotionally durable design" (PDF). ^ "Gold joint (mending gold) What is it?" (in Japanese). 2013-05-04. Retrieved 2014-04-02. ^ Kahn, Eve (January 17, 2013). "It's as Good as Glue: Mending Shattered China". New York Times. Retrieved 2014-04-05. ^ a b "Stapled Repairs on Chine; Confessions of a curious collector". Antiques Journal. February 2012: 37–40. Retrieved 2014-04-05. ^ Taylor, Andrew (February 27, 2011). "Smashing idea to put it together again". Sydney Morning Herald. ^ "The Aesthetics of Mended Japanese Ceramics | Herbert F. Johnson Museum of Art". museum.cornell.edu. Retrieved 2017-09-23. Flickwerk: The Aesthetics of Mended Japanese Ceramics — Christy, James; Holland, Henry; Bartlett, Charly Iten (2008). Flickwerk: The Aesthetics of Mended Japanese Ceramics. Cornell University, Herbert Johnson Museum of Art. ASIN B009F3YENM. Perfect Imperfection (The Art of Healing) — Bond, Billie; Spencer, Dr Jeremy (2017). Perfect Imperfection. United Kingdom: Blurb. ISBN 978-1366121998.